Antique Sommer & Sapunaru KG prüft und aktualisiert die Informationen auf ihren Webseiten ständig. Trotz aller Sorgfalt können sich die Daten inzwischen verändert haben. Eine Haftung oder Garantie für die Aktualität, Richtigkeit und Vollständigkeit der zur Verfügung gestellten Informationen kann daher nicht übernommen werden. Gleiches gilt auch für alle anderen Webseiten, auf die mittels Hyperlink verwiesen wird. Antique Sommer & Sapunaru KG ist für den Inhalt der Webseiten, die aufgrund einer solchen Verbindung erreicht werden, nicht verantwortlich. Des Weiteren behält sich die Antique Sommer & Sapunaru KG das Recht vor, Änderungen oder Ergänzungen der bereitgestellten Informationen vorzunehmen. Inhalt und Struktur der Webseiten der Antique Sommer & Sapunaru KG sind urheberrechtlich geschützt. Die Vervielfältigung von Informationen oder Daten, insbesondere die Verwendung von Texten, Textteilen oder Bildmaterial, bedarf der vorherigen Zustimmung der Antique Sommer & Sapunaru KG. Since founding our Conservation and Restoration services in 1962 in Munich, Germany, we have dedicated ourselves in providing only the finest work. 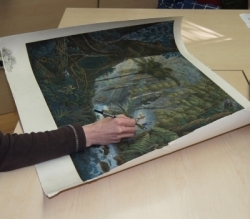 Our conservation and restoration process does not harm paper fibers or original hand coloring. 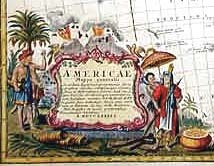 We are specialized in antique maps, views and prints from 15th to the 19th century, on linen mounted paper and all kind of hand made paper. Acid Burn – Browning or yellowing of the paper. Matte Burn – Brown line of acid burn around the image. Foxing – corroding particles in paper create unsightly brown spotting. Acidic backing and/or matting – can cause acid burn if not removed. Tape and adhesive – will stain the paper if not removed. Water Damage – rippling, mold or mildew and staining can all occur from exposure to moisture. Insect Damage – silverfish eat away paper and pigment, droppings can deteriorate and stain paper. Handling cockles, deep folds, wrinkles and rippling. Surface dirt – dust, fingerprints insect droppings, soot, etc. Abrasions – scuffs, shiny marks, scratches with pigment loss, textural damage. First we dry-clean the face and verso to remove all loose surface dirt and soiling. The original coloring will be sealed in, making sure all coloring is retained during the remainder of our work. Next step begins the actual cleaning process to remove stains and flaws with a procedure of deacidification. Throughout this entire process, every attempt has been made to use nondestructive chemicals. We are using naturally safe methods which are dedicated to preserving the original surface of the paper, the printing ink and the original color. 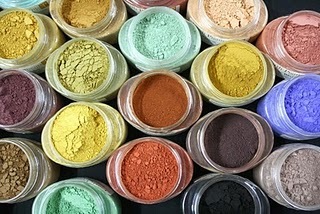 On demand, we also refresh colors when they has been blanched due to sunlight or natural aging. We are using original lightfast pigments and all coloring will be adapted to the contemporary colors which had been used at the time of issue of the print. 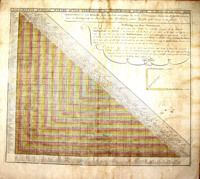 We will use original hand colored maps, views and prints as samples, to verify the perfect pigment mixture. Every century has his own type of colors, mixtures and style. All paper and color problems are very individual and the work can be evaluated only by concrete examination first. Therefore, we will be always happy to give you a guaranteed calculation of our work in advance.